We’re very excited to finally share the news with you - we're live! Our Badger volunteers have worked their magic and built an amazing app, available for download on iOS and Android. The app will help festival-goers discover, plan and navigate this year’s Pride festival in London. On top of that, it also includes important information about the day’s programme. As part of a social value project, the app was built by 34 badgers and a mix of Pride volunteers in over 1,060 voluntary hours and 280 pro-bono days (still counting) including more than 34 features. Our team chose to use the latest React Native technology to develop the app, which will make it easier to build for both iOS and Android at the same time. It was designed to be open source so that it can be further enhanced each year based on user feedback and insights, negating the need to start completely from scratch. This also means that any other Pride or LGBT+ organisation in the world can download the source code and use the app for their own needs. To ensure our pride app is as inclusive as possible, Pride in London has made it fully accessible from its design principles right through to meticulous testing and development. So now, regardless of abilities, everyone can enjoy the app and get the most out of it. Working on the Pride App was and still is an awesome experience for all of us. It’s amazing to see that everything is possible and achievable when talented, passionate people work together to solve a problem and make things happen. 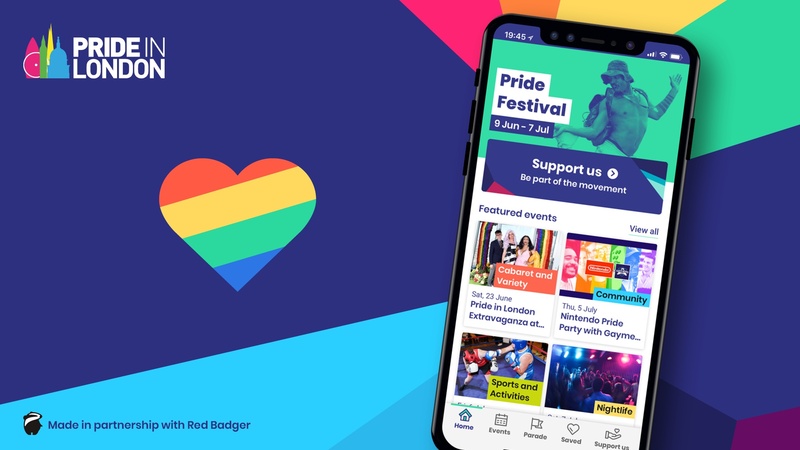 We’re so excited to finally see the Pride app live, and seeing people downloading and using it to plan for the forthcoming festival. Download the new brand new Pride in London app for iOS here or Android here.